Exporter of a wide range of products which include ceramic fiber rope. 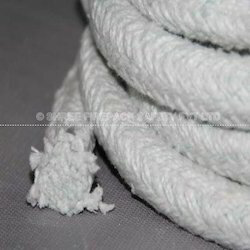 Ceramic Fiber Ropes are made from Ceramic Fibre yarn and reinforced with Fiberglass/SS wire. Braided ropes are made from ceramic fiber enclosed in a Glass fibre braid or SS wire braid to give excellent handling strength. The above ropes are light weight, resilient, high temperature resistance and chemical stability.